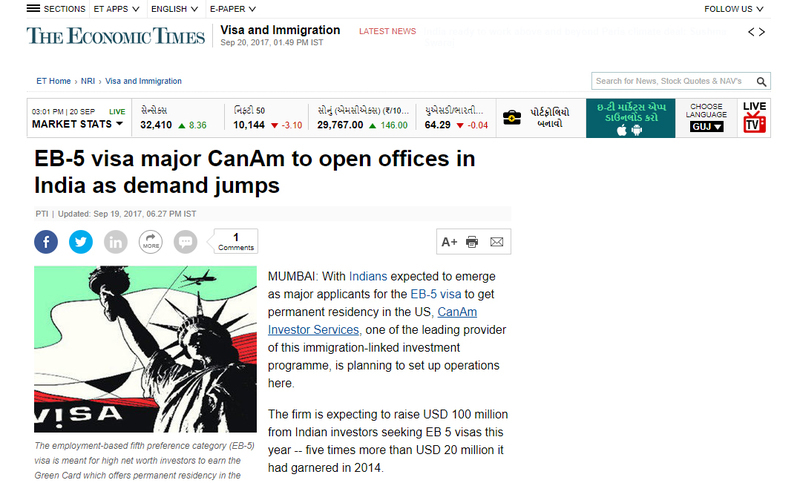 With Indians expected to emerge as major applicants for the EB-5 visa to get permanent residency in the US, CanAm Investor Services, one of the leading provider of this immigration-linked investment programme, is planning to set up operations here. The firm is expecting to raise USD 100 million from Indian investors seeking EB 5 visas this year -- five times more than USD 20 million it had garnered in 2014. The employment-based fifth preference category (EB-5) visa is meant for high net worth investors to earn the Green Card which offers permanent residency in the US for themselves and their immediate family through a one-time minimum investment of USD 5,00,000 into a new US business that creates 10 or more jobs for the Americans.